Stunted growth in children under-five is a useful anthropometric indicator of a population’s nutritional and health status. While quite a number of studies have highlighted the importance of maternal education on child health outcomes, in this article, the relationship between maternal education and stunted growth in under-five in Nigeria will be examined. This introductory section provides an overview on the background and justification of this article. It also introduces the problem and the concepts that will be used throughout this article. Malnutrition in under-five children is one of the many health challenges facing Africa especially sub-Saharan Africa today. Malnutrition as a problem does not only impact health but also the education and economy of the affected individuals. According to UNICEF (2017), it is estimated that about 3 million under-fives die as a result of under nutrition every year. 1 in every 4 under-fives are undernourished globally and most of these malnourished children live in sub-Saharan Africa and South Asia (UNICEF 2017). Malnutrition, according to the United Nation System Standing Committee on Nutrition (UNSCN), is estimated to be the largest single contributor to morbidity (UNSCN 2017). It is a pathological state that results when essential nutrients necessary for living functions are inadequate or are over the stated amount (UNICEF 2001). Behman et al (2004) posits that there are four forms of malnutrition: protein calorie or protein energy malnutrition (PEM); over nutrition; micronutrient malnutrition; and secondary malnutrition. This article focuses on protein energy malnutrition. Protein Energy Malnutrition results when energy and protein rich foods that are necessary for growth, health and activity are not taken in sufficient amounts and manifests as marasmus or kwashiorkor or marasmic kwashiorkor. Marasmus is characterized by emaciation and this is as a result of inadequate intake of protein and calories while, kwashiorkor is a condition that results when there is insufficient protein intake, with a reasonable amount of caloric intake. The common feature in kwashiorkor is oedema. It mostly affects young children and a characteristic clinical feature is the swollen abdomen. An elucidation on why some children waste gradually without developing oedema while others waste less but develop oedema is still unknown. However, a study by Forrester et al (2012) suggests that Marasmus represents an adaptive response to malnutrition, whereas Kwashiorkor represents a maladaptive response to malnutrition. Sub-clinical forms of PEM are associated with reduced cognitive function, poor physical performance and an increased susceptibility to infections. Protein energy malnutrition is of three types in children: Acute malnutrition which is characterized by wasting and thinness; chronic malnutrition which is characterized by stunting or shortness and lastly a combination of chronic and acute malnutrition which is characterized by the child being underweight. Wasting or low weight-for-height is a strong predictor of mortality among children under five (Vesel et al 2010). It results when there is an acute significant food shortage and intake coupled with high incidence of disease especially diarrhoea. Low weight for age or underweight is also a predictor of mortality among children under five (Vesel et al 2010). It reflects body mass relative to age. Weight as a measure is constantly changing over time and therefore in cases of malnutrition can reflect acute, as well as chronic malnutrition. The choice of underweight as an indicator to track progress in addressing hunger in the Millennium Development Goals and now the Sustainable Development Goals has been criticized because the incidence of overweight in many areas give a false impression that progress is being made in addressing underweight, hence, masking stunting (Uauy et al 2008). Stunting, or low height for age is caused by long term insufficient nutrient intake and frequent infections. It generally occurs before the age of two and effects are largely irreversible. It is an indicator of long term chronic nutritional deficiency that accumulates during pre-natal and post-natal period. Stunting in early childhood has been linked to delay in motor development, intelligence quotient and neurosensory integration (Grantham-McGregor and Fernald 1997). It is also associated with impaired mental capacity and school performance which has long term consequences such as reduced adult work capacity in adult years (UNICEF 2001, Jukes et al 2002). 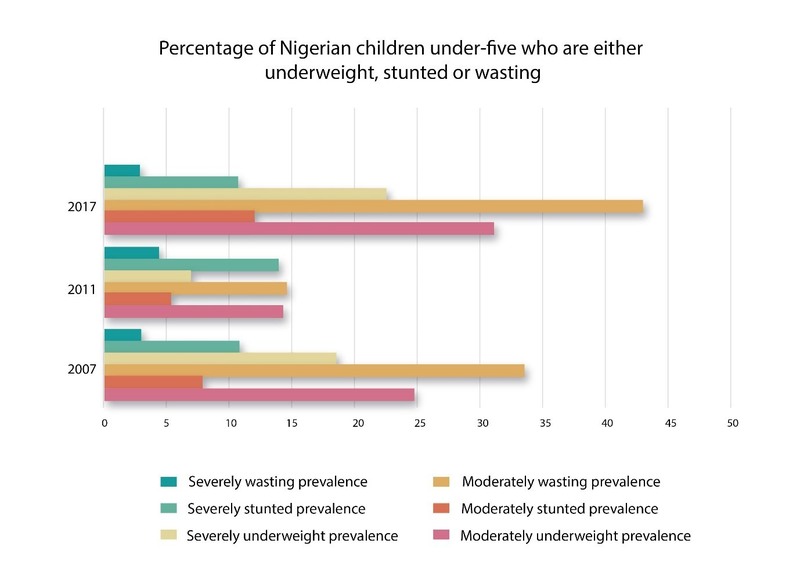 Figure 1: Percentage of under-fives in Nigeria who are either underweight, stunted or wasting. The chart above displays the summary statistics for the prevalence of moderate and severe underweight, stunting and wasting in children under-five in Nigeria (UNICEF 2017, National Bureau of Statistics 2017). What is striking about the figures in this chart is the clear trend of increasing prevalence of moderate and severe wasting, underweight and stunting in children under-five in Nigeria from 2011 to 2017. This increase may be largely due to the Boko Haram crisis in the North-Eastern part of the country (Emmanuelar 2015; Cumber et al 2017). The global dilemma of stunted growth can be seen with the aid of the table shown in table 1 by a recent joint estimate by the WHO, UNICEF and World Bank (2017). An estimated 155 million children (22.9%) under five years of age were stunted in 2016. More than 90% of all stunted children in the world live in Africa and Asia. This high prevalence remains a huge public health burden yet unrecognized. In developing countries deeply rooted in poverty and starvation, stunting (low height-for-age) is more prevalent than underweight (low weight-for-age) and wasting (low weight-for height) as an increase in height responds faster to diet quality than a gain in weight (SCN 2010). Estimates from UNICEF (2017) show that 37% of under-fives in Nigeria are stunted. Figure 2 above shows percentage of stunted children in six geopolitical regions. 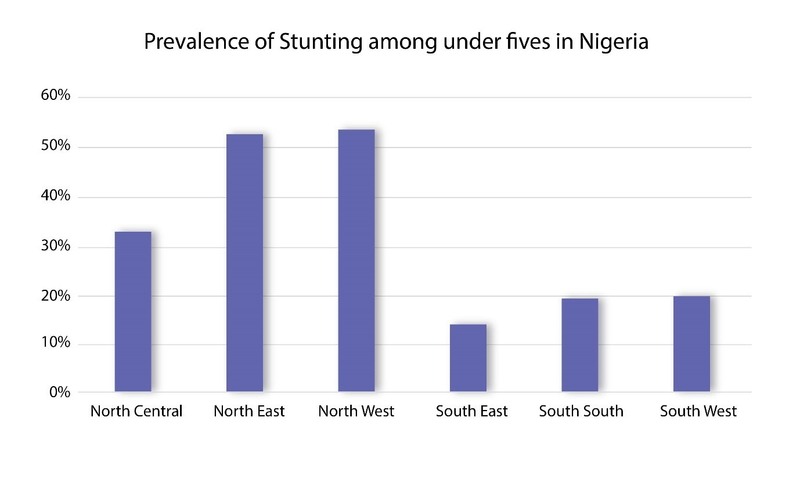 The North Central, North East and North West have the highest prevalence of stunted children – 33%, 53% and 54% respectively. The South East has the lowest with 14% of stunted under-fives while the South West and South South have a prevalence of 20% and 19% respectively. Growth represents both nutritional and hormonal mechanism that function to bring about change in the human body. Growth is the sum total of environmental influences which usually begin at childhood and can affect health later in life. Growth is a measure of the diet one takes and can be used to measure success of nutritional interventions. Physical growth and strength is a source and determinant of labour and productivity. Growth is the measure of the standard of living of individuals and communities as it captures the changing nutritional status of individuals in a geographical area. Over the past 50 years, much information has become available on stunted growth. Surveys such as those conducted by Steckel (1989) and Tanner (1962) have shown that stunting in children is sensitive to the prevailing social and environmental circumstances. Stunting or the process of stunting which usually begins in the first year of life until about the age of three where it finally slows down (Shrimpton et al 2001) is particularly sensitive to seasonal changes in food supply and in the burden of infections (Nabarro et al 1988; Tanner 1976; Martorell et al 1994; Walker et al 2007).However studies have reported the substantial catch-up between 2 and 12 years in children who were previously stunted and received no intervention (Adair, 1999). It is also possible that catch-up height cannot occur until a child moves to a different environment (Coly et al, 2006). Understanding how maternal education affects child stunting is of critical importance in public health policy and has been well demonstrated (Caldwell 1979; Ruel et al 1992; Kabubo-Mariara et al 2001). Over the past 20 years, there has been an increasing drive to promote free primary education in Africa. In promoting primary education, it is assumed that this will lead to improved nutrition and health seeking behaviour that will have an impact on the populace. It has been argued that educated women tend to be more proactive in giving children a balanced amount of food and at the appropriate time; managing infant diarrhea by seeking early action and immunization against diseases (Thomas et al 1991; Hobcraft 1993; Okeke and Okeibunor 2010). 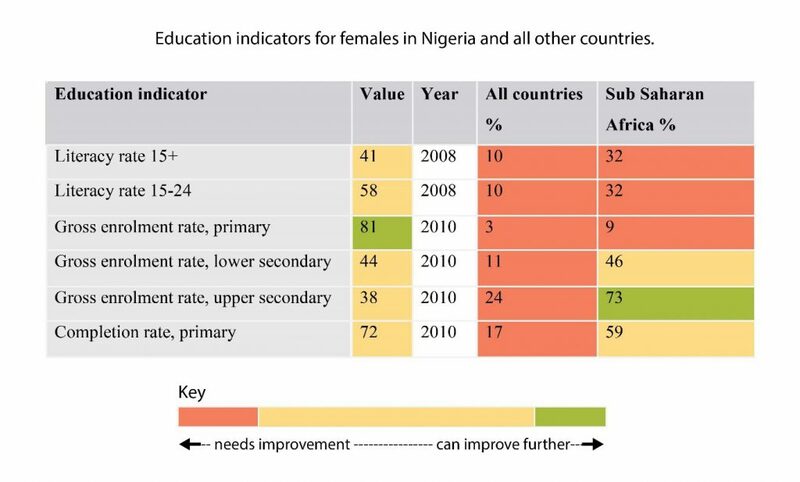 Figure 3: Education indicators for females in Nigeria and all other countries. Figure 3 shows the different education indicators for females in Nigeria compared to sub-Saharan Africa and all countries. Performance is measured by the percentile rank i.e. higher percentile indicates a better performance than lower percentile. Nigeria’s standing relative to these countries is given by the percentile rank. The colour green indicates high ranking above 66% while yellow is average ranking that lie between 33% and 66%. The colour red represents low ranking below 33%. It is apparent that relative to all countries, Nigeria ranks lower in all the education indicators considered. Evidence from studies in Nigeria suggest that the influence of maternal education on child stunted growth is a positive one (Madusolumuo and Akogun 1998; Ojofeitimi et al 2003; Ajao et al 2003; Babatunde et al 2011; Adekanmbi et al 2013; Amugsi et al 2017). Most of these studies reported that mothers/women with a minimum of primary education are less likely to have stunted under-fives compared to mothers with no formal education at all. A study conducted using data from Nigeria Demographic Health Survey (NDHS) 2013 corroborates this finding too (Smith-Greenway, 2013). Stunting apart from its physical effect is also accompanied by changes in cognitive function and behaviour (Martorell et al 1994; Daniels and Adair 2004). The goal 2 of the Sustainable Development goals (SDGs): “end hunger, achieve food security and improved nutrition, and promote sustainable agriculture” (Goal 2) is targeted at ending all forms of malnutrition by 2030. The World Health Assembly (WHA) also aims to reduce the number of stunted children by 40% by 2025 (WHA 2012). Hence, stunted growth in children under-five is of great importance and provides a rallying point for financial commitments by likeminded stakeholders and governments. Policies relating to education and health must not be treated in isolation. This is because of the relationship between maternal education and child health. Relevant government agencies in Nigeria must undertake a systematic and coordinated approach with regards to health and education. In making policies in Nigeria, health impact assessments must be applied so that better decisions can be made which will inevitably lead to better health outcomes. Mothers/women with little or no education should be targeted during public health nutrition and other health intervention programmes. In addition, child nutritional programmes targeting women with little or no formal education should be introduced so that mothers and caregivers will be equipped with child nutritional knowledge to improve the nutritional outcomes as well as the health of their children. Adekanmbi, V. T., Kayode, G. A., & Uthman, O. A. (2013). Individual and contextual factors associated with childhood stunting in Nigeria: a multilevel analysis. Maternal & child nutrition, 9(2), 244-259. Ajao, K. O., Ojofeitimi, E. O., Adebayo, A. A., Fatusi, A. O., & Afolabi, O. T. (2010). Influence of family size, household food security status, and child care practices on the nutritional status of under-five children in Ile-Ife, Nigeria. African journal of reproductive health, 14(4). Amugsi, D. A., Dimbuene, Z. T., Kimani-Murage, E. W., Mberu, B., and Ezeh, A. C. (2017). Differential effects of dietary diversity and maternal characteristics on linear growth of children aged 6–59 months in sub-Saharan Africa: a multi-country analysis. Public health nutrition, 20(6), 1029-1045. Babatunde, R. O., Olagunju, F. I., Fakayode, S. B., & Sola-Ojo, F. E. (2011). Prevalence and determinants of malnutrition among under-five children of farming households in Kwara State, Nigeria. Journal of Agricultural Science, 3(3), 173. Cole, T. J. (2003). The secular trend in human physical growth: a biological view. Economics & Human Biology, 1(2), 161-168. Coly, A. N., Milet, J., Diallo, A., Ndiaye, T., Bénéfice, E., Simondon, F. and Simondon, K. B. (2006). Preschool stunting, adolescent migration, catch-up growth, and adult height in young Senegalese men and women of rural origin. The Journal of nutrition, 136(9), 2412-2420. Cumber, S. N., Jaila, S., Nancy, B., & Tsoka-Gwegweni, J. M. (2017). Under five malnutrition crises in the Boko Haram area of Cameroon. South African Journal of Clinical Nutrition, 30(2), 41-42. Emmanuelar, I. (2015). Insurgency and humanitarian crises in Northern Nigeria: The case of Boko Haram. African Journal of Political Science and International Relations, 9(7), 284. Hodge, A. M and Zimmet, P. Z. (1994). 5 The epidemiology of obesity. Baillière’s clinical endocrinology and metabolism, 8(3), 577-599. Madusolumuo, M. A., & Akogun, O. B. (1998). Sociocultural factors of malnutrition among under-fives in Adamawa state, Nigeria. Nutrition and health,12(4), 257-262. Nabarro, D., Howard, P., Cassels, C., Pant, M., Wijga, A., and Padfield, N. (1988). importance of infections and environmental factors as possible determinants of growth retardation in children. In Nestle nutrition workshop series. Ojofeitimi, E. O., Owolabi, O. O., Aderonmu, A., Esimai, A. O., & Olasanmi, S. O. H. (2003). A study on under five nutritional status and its determinants in a semi-rural community of Ile-Ife, Osun State, Nigeria. Nutrition and health, 17(1), 21-27. Smith-Greenaway, E. (2013). Maternal reading skills and child mortality in Nigeria: a reassessment of why education matters. Demography, 50(5), 1551-1561. UNICEF (2017). Malnutrition [online] Available at: https://data.unicef.org/topic/nutrition/malnutrition/ [Accessed 19 Jan. 2018]. UNICEF (2015). The state of the world’s children 2015: Child survival (Vol. 8). UNICEF. UNSCN. (2017) By 2030, end all forms of malnutrition and leave no one behind. [online] Available at: https://www.unscn.org/uploads/web/news/document/NutritionPaper-EN-may2017-WEB.pdf [Accessed 19 Jan. 2018].